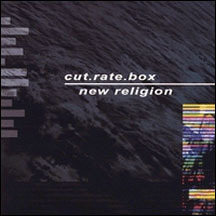 New Religion is the latest release from the US based electro/industrial outfit known as cut.rate.box. Equipped with driving synths and pulsing beats, the tracks on New Religion fills the void left by one time perennial favorites Front 242 and Nitzer Ebb. Tracks such as Traummaschine, Restless and New Religion have already become staple club tracks across the globe. New Religion features guest vocal from Stefan Netschio of Beborn Beton (Lichtspiel der Gebrochenen Herzen), Adrian Hates of Diary of Dreams (Lichtspiel der Gebrochenen Herzen), Stefan Ackermann of Das Ich (Heart Break Cinema), Daniel Myer of HMB and Haujobb (Nothing) and Kurt Harland of Information Society on the Depeche Mode cover of Behind the Wheel.